Life-of-Ryan: Our *Not-So-Auspicious* Adventure !!! We are going to Hike Through a Dry Prairie Ecosystem. Dry Prairie Ecosystems in Florida. 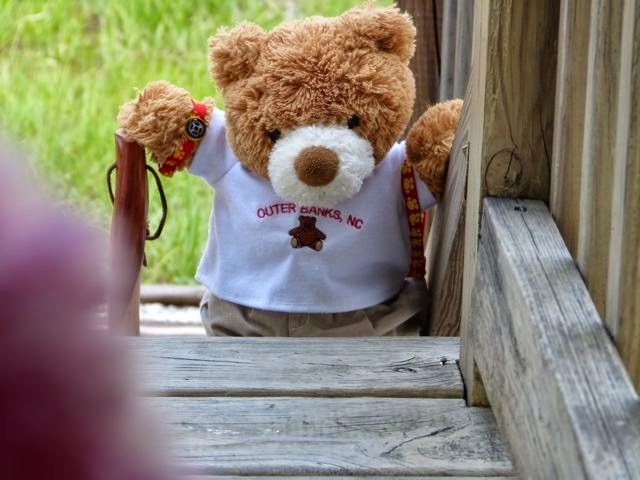 for Myakka River State Park. and All our Equipment, Ryan? The Road is Flooded in Places, Ryan. from decaying Vegetation in Swamps and Wetlands. and the Southern United States. Look, Ryan! A Mother Deer and her Fawn! How Pretty they are! Here is Where we Get Off the Road, and onto a Trail. Wow! A Florida Soft Shelled Turtle! He's BIG! I Wonder if he was Eating these Flowers? This is a Long Trail, Dad! It is 5.4 Miles to the Bee Island Primitive Campsite. There are 35 Miles of Trails through this Park, Buddy. Yes, Ryan... Indeed! This one has been Dead for a Long Time. Some Animal may have Eaten it. The Wilderness is a Dangerious Place. these Guys are just Waiting for an Animal to Get Killed or Die! A Late Afternoon Stormfront is Coming in Quickly!! Let's Set-Up Camp Here, Ryan. There is some Shelter from the Winds. and you can Set Up your Tent Close By. How is Your Campsite Going? I've Set my Tent Up, Dad... and I have my Supplies Set Out. Well– let's get a Quick Hot Cocoa Drink into us before the Storm comes. I'll Watch the Cocoa, Dad! I'm So Glad to be Out Camping with you! I Hope that Mommy is OK without us! she is Probably Worried about us Out Here in the Woods! Good-night, Ryan. Enjoy your Tent and Sleeping Bag. I will be Right Here in my Camping Hammock if you Need me. I Slept in All my Clothes! I'm All Ready to Go!! Hold On There, Buddy– We've Gotta' Have Breakfast First! I'll Watch our Breakfast Cook, Dad! We have Nuts, Dried Cherries and Raisins in our Oatmeal. Ryan– you've Got to Take your Tent Down. Here is our Trail. See the Blue Blaze on the Trees, Ryan? Not Very Far Now, Ryan. It is a Clay Turpentine Pot Fragment called a 'Herty Cup', Ryan. so that their Sap (or 'Pine Rosin') would Gather into Small Clay Pots. They would Gather the Sap from the Pots and Boil it to make Pitch and Turpentine. We will Put it Back Where we Found it, Ryan. It Belongs to this Park as an Artifact. but we Made It to Bee Island for Lunch, Instead. Wait, Please, Ryan... Read the Sign, First. We Have our Own Water to Drink. Plus, I've Packed us some Coconut Water. if we Wanted to Use it, Ryan. We have Enough Water– let's Eat Lunch! and Canned Diced Peaches for Dessert! for the Next people who Stop By. First, I'd Better Send a *Happy* Picture to your Mom so she Does Not Worry about us. Here are the Trails, Ryan. Where would you Like to Go? Mossy Camp Sounds Nice. Let's Go There! This Prairie has Lots of Flowers, Dad! Yes, Ryan. And they are Beautiful! This one is Very Purple–ish, Dad! I Think that Bees Would Enjoy This One Very Much. Oh– Ryan!! This is Bear Poop– from an Adult Bear! See How Many Berries that the Bear Eats? Well– Wild Bears Just Do Not Do That, Ryan. You've Been Taught Civilized Manners! Dad. Where did our Trail Go? I *Think* that it's Over Here, Ryan. Let's Walk that Way for Awhile. Dad! What's That? It Looks like a Crab Pincer. It Certainly is a Crab Claw, Ryan. The Entire Carapace of a Crawfish! Crustaceans are Throughout the Park and Provide Food for Many Animals. I Believe that I've Accidentally Mislead us, Ryan! Let's Stop Here and Camp for the Night, Ryan. Alligator Hole and One Deep Alligator Hole. Amazing!! The Most Important Thing is That we Have Water!! There's our Camp for the Night, Ryan. ...but you Can Never Know. so that it is Safe to Drink. Out of my 16 oz. of Water before I Boiled it! The Next 16 oz., I had to Remove a Very Small Fish! We are Very Lucky to Have a Log to Sit Upon for our Meals, Ryan. Our Dinner Menu Tonight is: Sardines, Crackers, Hot Tea, and Canned Fruit. Good! I Like Sardines, Dad! I Like Canned Fruit, too! I Know that we Hit the North Boundary Fence Line for the Park. I Don't Want to Set-Up my Tent, Dad. I'm Scared. I Want to Sleep With You in the Hammock. This is a Lot Better, Dad. Thanks! Good Night, Ryan. Don't Worry too Much. Tomorrow is the Day we Go Home. it was Rather Cool Last Night. Well–– Out of our Shade and Into the Blazing Sun. I Can See Power Lines Far Off in the Distance. I Believe they are About 4 Miles South of Us, Ryan. and Make Sure they are in Sync. Good–– they Are. We are Going To Go Cross-Country South Toward the Power Lines. I Know Where that Road Comes Out. Most Important When One is Lost. Everything Here is Sharp and Needle-Like and up to Waist High, Ryan. You Can Ride Up on Top of my Pack, Ryan. You'll be Safe There! take us South toward the Power Line Road. We Absolutely MUST Get Out of this Sweltering Sun. for Miles in the Hot Sun is Absolutley Wearying. Amazing that I Just had Knee Surgery on the 17th of April. So Hard with a 30 lb. Backpack. I've already Gotten the Chills that Presage Heat Stroke. Been Stopping Bent-Over and Gasping for Breath every few Yards. Daddy– I See the Power Lines! We're Going to Be OK, Right, Daddy?! We will Make it Home to Mommy and your Sister, Pinkie. Left @ 190 lbs.– Returned @ 178 lbs. Got Ryan Safely Home to Mom and his Sister, Pinkie! Oh–– Ryan!! You're SAFE!!! I was So Worried about you!!!! What a great adventure! You have your own special hiking hat? (grumbles from two little bears..) AND your own special tent and sleeping bag? 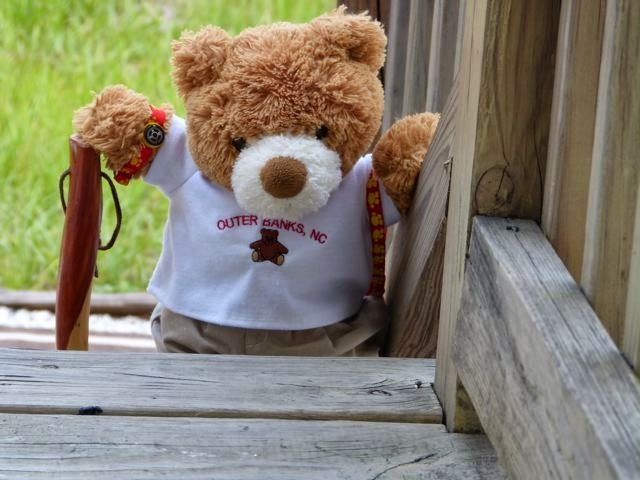 (more grumbles from two little bears...) We are jealous! Did you make smores around the camp fire? They are so beary good! I am so glad you got home safely and I am so jealous of your adventure (and hiking supplies). It sounds like quite an adventure but looks like lots of fun. So what did Pinkie do while you were camping? Pinkie says: Well, Little Fox– Mommy and I tried-on new clothes. She brushed my hair for me so nicely and we went shoe shopping. 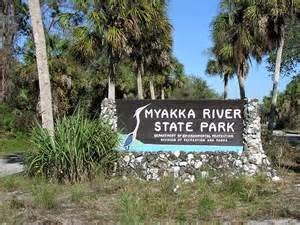 I read about some science experiments that Ryan and I can do soon and I tried to think *Happy Thoughts* about Ryan and my Dad in the wilds of Myakka River Park in mid-summer. So glad to see Ryan (and Daddy) SAFELY Home!